This guide was written by an MBA turned PT and a PT clinic manager who decided it was time to give Physical Therapists the upper hand in a job interview. So they wrote the book on PT Job interviews to prepare new PT graduates and existing Physical Therapists with strategies and tips to ace an interview and negotiate the best offer. 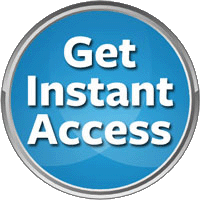 You feel that your interview skills could use a little extra push to help you demonstrate that you are a great fit for your next PT Job. Want to ask for that 20% increase in pay, but you’re not sure how to phrase it. You will likely get a job offer whether you purchase this guide or not. The question is this: How much more would that job offer be if you used the strategies included in the PT Job interview guide? Negotiating even just $0.50 more an hour translates into $1,040 extra dollars in your pocket. Our negotiation scripts will give you the confidence to ask for much more than $1,000 a year in higher salary. The new PT graduate who is looking for their first job, but doesn’t feel confident in knowing how much they’re worth and how to relay this through their resume and interview. The current Physical Therapist who wants to look for a better opportunity, but feels ‘out of the game’ and gets frustrated just thinking about the work it will take to change jobs. The Physical Therapist who is looking to change their specialty or setting altogether and needs insight for promoting their skills. The PT who is returning after taking some time off. They’re looking to sharpen their interview skills and to create a killer resume to land an awesome job. You didn’t invest thousands of dollars in Physical Therapy school to graduate and enter the workforce at the lowest salary possible. 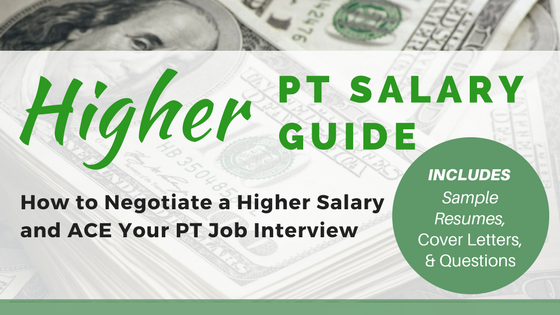 The Physical Therapist Job Interview Guide equips you to ask for what you’re worth and then some. 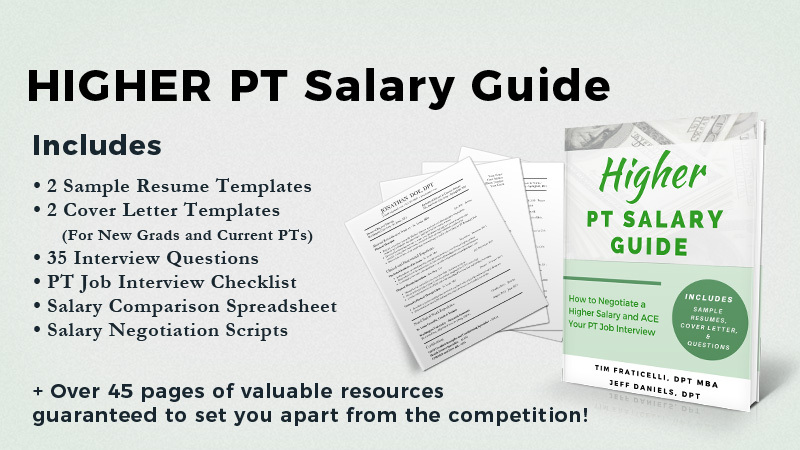 Purchase the Higher PT Salary Guide and set yourself up for success on your next career move.